For the post-modernist, there is no Truth. This, in fact, constitutes their One Great Truth, from which all their ideals, such as they are, derive. Without the Objective in mind, anything goes. And we see proof of the failure of post-modernism in its products: music that isn’t musical, literature that isn’t literate, art that isn’t aesthetic, theater that isn’t theatrical. Wherever it worms its way into the consciousness, it wreaks its havoc by means of its myriad resentments and destructive intent. But look instead to the aesthetic products of the Enlightenment and we are witness to the extraordinary aesthetic soul-nourishing discoveries that remain with us centuries later. Rid of the post-modern, everything in the arts improves. We’ve all got a lot to look forward to! A toast to 2018 and what awaits! And I began to think, somewhat despairingly, that human beings of that age were more fully human than we are of this one. We taste only the surface of life; they knew something more. For surely it takes an experienced personality — that of a varied, profound life in the face of death, or, at any rate, an aesthetic genius — to act in the fullest sense of the archetypal. Here is one scene of the film, from which you might glimpse what I mean. Watching Werner Herzog’s, “Fitzcarraldo,” operatic and heroic in a Teutonic sense, in which Klaus Kinski’s character leads a motley crew and an Amazonian tribe to hack out of the jungle a channel over which they haul a ship over a mountain. Shooting the movie was as heroic! What struck me was this dialog, inasmuch as it might be considered an unintentional comment on realism (my bugbear). I am not surprised to know that Herzog, who despises cinema verité, wrote the script. Whereas in civilized living among enlightened individuals, deception indicates knowing falsehood, and thus an unstated admission of intrinsic wrongness; in the arts, it is a virtue. But only if the artist’s intention — the meaning of his work — is constructive. In other words, the ideas must be right if the seeming falsehood of their presentation is to be made honorable and true. Works which deceive for propagandistic purposes are mendacious in a destructive way: destructive of our ability to appreciate Beauty, and thus to enrich our lives. We see in this country a vast body of such work in all the arts. I’m reminded of my life in China in the 1980s, when overwhelming political forces and their adherents hogtied the arts. (The iron curtain countries as well.) We in this country experience something similar, although we don’t suffer the deprivation of liberty or property those dissidents endured. But the tide has turned. I see enough young people (and some my age, too) looking for something better. How about the last 500 years of Western aesthetic tradition for inspiration? Deception — intentional unreality — in the forum intended for it, in the right spirit, is paradoxically the vehicle for truth. So, we reorient in the direction in which we need to go once again. My agreement with this sentiment puts me squarely against the last 50 years of radical selfism in the arts, which delights me no end, since we have something much better (with the proper application, nourishment and direction) coming within a generation. 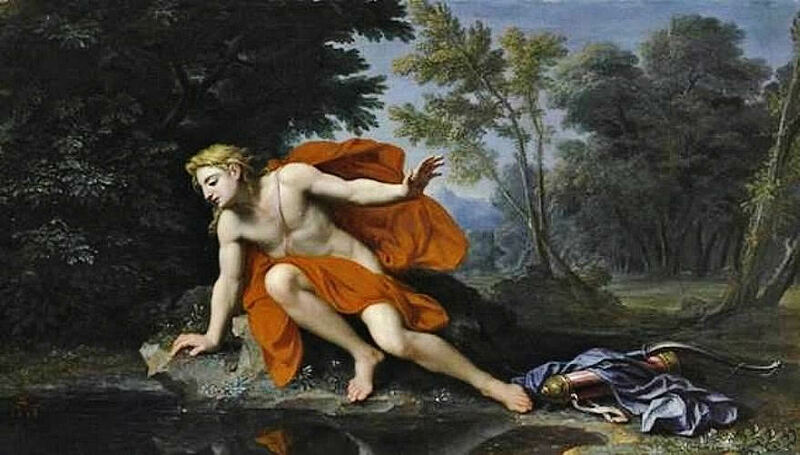 Narcissus, the son of a god and a nymph, was a beauty, who, seeing his reflection in a pool of water, became transfixed with it. Seeing only himself, and unable to pull away, such was his self-adoration, that he pined away to nothingness. Such is the story of many American actors. Acting in this country has become the province of self-adorers. Wynt, you are being most unfair, you say. Hardly! Actors are routinely instructed “on the best authority” to rely heavily upon their own personal life experiences and emotions (what are emotions?) to enact “real” feeling in a fictional character they’ve never been or met: this is the adoration of the self. But it’s not about you. And thank goodness for that, because if we limited dramatic performance to our rather dull, dreary, routine everyday lives, we’d get…oh my, we’d get dull, dreary, routine everyday drama. Do you see where I’m going with this? What I call the modern dramatic fallacy occurs when a writer of drama convinces himself he is writing about “life.” Life as an objective fact (though entirely based on his own personal life experience, often word for word conversations!). The actor then buys into it, taking the modern approach by searching within himself for similar “emotional resonances,” which redoubles the conviction of the writer. Instead, my perspective is this: the writer (I speak here only of dramatic works) puts forth ideas, which float around in his own consciousness, into the world through a contrivance of scene, character, dialog and action. The work is understood to be entirely imaginative and purposefully written as a falsehood (but, and this is essential, whose purpose is to uncover Truth through story). The actor searches the script for clues to meaning, blowing into the limp balloon his own hot air — his imagination, the quality of which is demonstrated in the use of language and body, surprise and exaggeration, entirely “unreal,” and founded upon the text itself. The audience, knowing of the intentional falsehood, accepts for the brief time they (the writer’s ideas) are enacted in front of it, the persuasively demonstrated ideas as true ** within the confines of the stage. ** Or film or whatever medium. The former approach is an intentional and hidden deception that perpetually pretends to truth, but only tells you of a subjective and narrow life; the latter an intentional and open secret shared by all of imaginative story, known to be story, that, while clearly false, demonstrates objective truth. That, the latter, is the true kingdom of Theater. Now, in the arts, and for the past 50 years, we’ve seen young people led away from the freedom of their imaginations and into the binds of ideology. Promising young artists know, instinctively, that something is wrong. Canaries in the proverbial coal mine. This is a good sign. But let’s get the canaries out of the coal mine into the fresh air. Now is the age of change in the arts. The past is rich; tradition, fertile; the collective wisdom of thousands of years of human experience. I post wherever I can to let those similarly thinking friends in the arts know that there are many of us are out here. Because the world has been turned upside down. Everyday life has become a realm of fantasy and the imaginative world has become the prosaic. (Such is the “disruptive” nihilist legacy of the Deconstructionists and Critical Theorists.) It is about time for artists and performers to jump ahead of this mess by jumping backwards, by hewing to the aesthetic traditions of Western civilization. In the dramatic works of the present day, we witness proof of the failure of the post-War thinking on aesthetic performance. Yes, they used to do it better. And so can we.